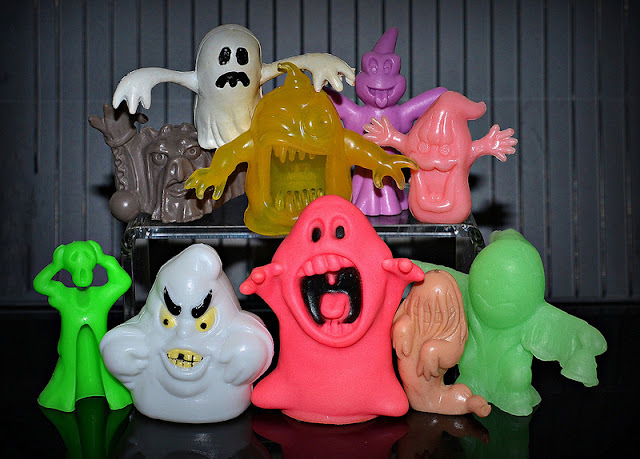 Little Weirdos: Mini figures and other monster toys: Phantasmic plastic: Ghost mini figures! Phantasmic plastic: Ghost mini figures! The other day I decided to round up a bunch of different ghost mini figures I own to make a ghostly group shot. How many different toy lines can you identify in this photo? Where is the ghost on the bottom row far right come from? It's from a set of rubber ghosts released in Germany by Pelikan. The three other sculpts I have are in orange, pink and yellow. Other than that I don't know anything about them. I had that Pineapple ghost as a kid. I traded it off a few years back but I'd love to stumble across another one. They're really cool. This is the only one from the set that I have. Where does the white ghost in the top row come from? Any clue how old it is?